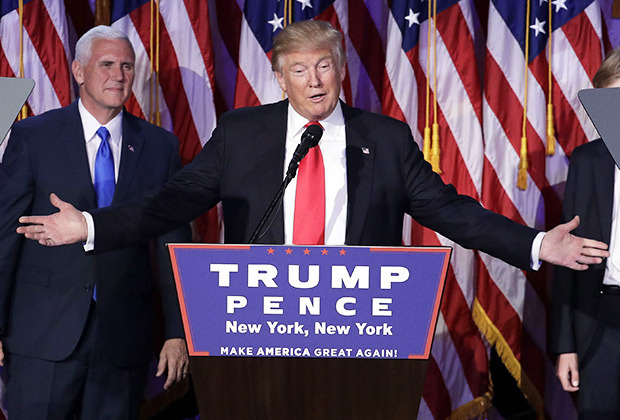 Republican nominee Donald Trump was elected 45th president of the United States on Tuesday in one of America’s most controversial elections to date. As the shockwaves of such a heavily disputed candidate winning office settle, one question arises: What does a Trump victory mean for Ireland? Perhaps the quickest reaction Ireland will see to the new president elect will be in an economic sense. “We are going to see extraordinary turmoil in the markets over the next few days, that’s going to cost investors money, and it’s going to cost pensions fund money,” said Irish Times Economics Editor Cliff Taylor in a video discussing how Trump will affect the Irish economy. In terms of trade, Trump has threatened to impose special import tax on goods coming into America. He also plans to cut US corporation tax in an effort to attract multinational companies such as Pfizer, Facebook, Google and Apple—all companies that have bases in Ireland due to the country’s loose corporate tax laws—back to the United States. “Big questions here for Ireland on what that will mean on the flow of foreign direct investment in the long term,” said Taylor. Trump also has very a very clear anti-immigration agenda that has the potential to send back some of the 50,000 undocumented Irish in the United States. This could be a major setback for the Irish government, who have been pushing the U.S. for years for a broad immigration reform, including more work visas for Irish citizens and travel exemptions that would allow undocumented Irish immigrants to visit home and return to America. Although Trump was very clear that he did not want illegal immigrants in the country, he was very vague on how to deal with undocumented immigrants and did not confirm where would they be sent. The 8,000 Irish students that travel on J1 visas every year could also be affected, as Trump said he wants the programme to be “terminated and replaced with a resume bank for inner city youth provided to all corporate subscribers”.